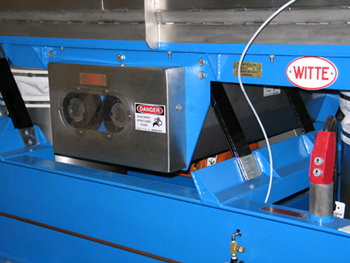 Washington, NJ: A new twin shaft vibratory drive from process equipment manufacturer The Witte Co., Washington, New Jersey (www.witte.com), features a proprietary design that produces the robust linear vibration required to deliver consistent motion to its large, high capacity fluid bed dryers, coolers, screeners and conveyors. Developed for smooth, high volume, 24/7 operation, the new twin shaft drive advances the company’s standard forced vibration drive design with a low maintenance approach that replaces gears, drive springs, counter reacting bases and crank arms with belts, oversized spherical roller bearings and an enlarged eccentric counter weight. By eliminating gears and other wear parts, the new Witte twin shaft drive eliminates oil lubrication along with its inherent safety concerns while operating at comfortable sound pressure levels of less than 80 dBA, 11% quieter than OSHA’s permissible industry standard. Ideal for specification when the drying or cooling area reaches an area of 100 square feet, the twin shaft drive provides ample flexibility to accommodate changes to the process or product and even permits on the fly lubrication during processing. The twin shaft drive is manufactured at the company’s New Jersey headquarters for inclusion on Witte equipment.